All transactions are safe and secure with a reliable history in online purchasing behind each of our associates. 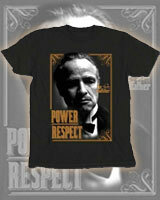 Buy The Godfather Power Respect t-shirt to own Godfather clothing and merchandise. Demand both power and respect in this Don Vito Corleone Godfather t-shirt that features a portrait of Don Vito (Marlon Brando) on the front. The movie's logo appears inside the portrait on the right next to Brando's face. Wear it with a Godfather hoodie sweatshirt, or give it as a gift with a Godfather movie poster. Someday, Don Vito may call on you for a favor. Will you be ready to answer his call? Guarantee good graces by wearing this stylish Don Corleone tee. Match it with Godfather hats. In addition to The Godfather Power Respect tee above, browse the Godfather Clothing Gallery for more apparel like men's and women's clothes, kids shirts or hoodies.